Each time I buy a new game I tend to have a bit of a gloat. I take a photo, put it on Twitter and see what people have to say about my latest purchase. In the main, people are complimentary and if they like the game it gets showered with praise. However ‘Zool’ really divided opinions. I bought it because I used to play it as a child on the Amiga. it was listed on eBay in immaculate condition and with free postage it was far too tempting to miss out on. While the game wasn’t a favourite from my youth I did recall it being quite good at the time. This was not an opinion shared by all my Twitter followers. “Zool is Sh*te” wrote one. “I thought my copy was broken as it was that awkward to play” wrote another. Amongst the negative bombardment however was glowing praise. “’Zool’ is possibly one of my favourite games ever”, “I loved that game, it was amazing back in the day”. A bit of research revealed perhaps why the opinions were so diverse. 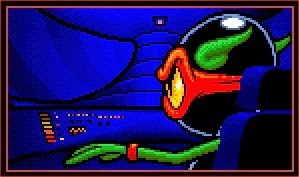 Evidently if you had an Amiga growing up you liked ‘Zool’, if you had a console you thought it was awful. A lot of this is no doubt due to the positioning of the game and the way it was sold. According to advertising blurb ‘Zool’ (the game and character) was “bad news for hedgehogs” and “plumbers”, “console action for your home computer”. You can almost imagine the conversations that occurred in Gremlin’s boardroom when the project was started. “What games are good on a console” one boss would say to a developer. “My boys play ‘Mario’” he could have replied. “Good Good, what works in that game” the boss would enquire. “Well maze like levels and hidden collectables”. 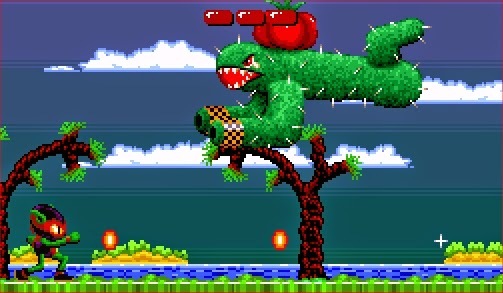 The boss would be pleased “Let’s stick those in then, anything else?” “’Sonic’ is really fast” another developer could have added “and in ‘Mega Man’ you can shoot things” another may have chipped in. A grin would probably have spread across the boss’s face. “Good work guys, stick all of those in a game and use every colour you can while making it”. 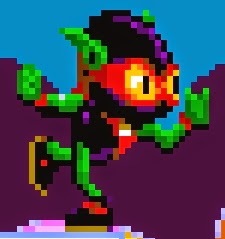 So liberally did the game borrow from successful platformers that according to Amiga Action, “originally Zool was able to perform a spinning roll, used to destroy any nasties in his way. Unfortunately this had to deleted due to possible copyright problems with Sega”. It was a game that the Amiga Action loved and they were not alone. All other Amiga publications were quick to sing the praises of their new mascot, elevating it far above any console contemporary. Amiga Format were the most vocal; “this is the game that can hold its head up and look consoles right in the eye. [It] makes Sonic and Mario look like the sad creations of teams of deluded child psychologists that they are.” Sister magazine Amiga Power echoed their view believing ‘Zool’ was “a ‘Sonic’ beater, the yardstick which other games of the genre will be measured against.” Almost in response when the game was released on the Snes, Nintendo magazines quickly jumped to the defense of their beloved machine. “Amiga owners are stuck for decent platform games. Snes owners are not. We expect a lot more from a game that this kind of pathetic bouncing and blasting” raged Total! magazine. Super Play was more polite but no less critical. “There are loads of really ugly and downright poor things to say about ‘Zool’. While a super-smooth platformer on the Amiga may have been something of a revelation, the situation on the Snes is, as we all known, somewhat different”. 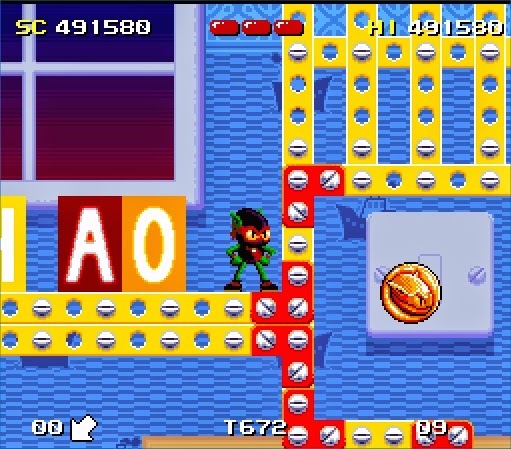 With a main character that can kill enemies by shooting or jumping on them, ‘Zool’ follows the platformer blueprint to the letter. The levels though are at least intelligently designed, echoing the likes of ‘Pop N Twinbee Rainbow Bell Adventure’. Very rarely will a level be a simple left to right affair and though the arrow in the corner of the screen points to the relative direction of the goal, its often best to go in the opposite direction to get the quickest route to it. The stage can only be completed however after 50 collectable items have be found. Each level is quite large and the game has dozens spread over words. 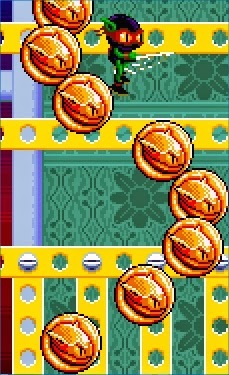 As is the tradition with platform games each world is based on a different theme, and each is interwoven into the gameplay in intelligent ways. Music World for example, has trumpets that propel you upwards, record player treadmills and piano platforms that make different sounds as you traverse the keys. Tool World sees drill bits moving through platforms as serrated edges make leaping across floating platforms harder, while Toy World has a working ‘etcha-sketch’. Not all ideas work though. With speed being so integral to the game anything that slows you down suddenly has a huge impact on the player’s enjoyment. Sticky treacle lakes in Sweet World for example can’t be jumped from so should you land in one you’ll have a slow trudge to get to the end of a platform. Equally frustrating are vertical climbs up spike covered walls, which are a pain due to the poor collision detection. Each world is ended with a confrontation with a boss, which are as imaginative as the enemies seen in the likes of ‘Parodius’ or ‘Robocod’. The method of defeating them though isn’t as creative as their design. Unlike taking on a Robot Master where pattern memorisation is key it’s simply a case of hitting the fire button as quickly as possible while running between the screen edges. The difficulty of the game though proved too much for some, with some magazine reviewers admitting they hadn’t managed to progress beyond the second world. Even though every enemy only needs one hit to be killed (rendering the power ups you can get pointless) they are too frequent in number. 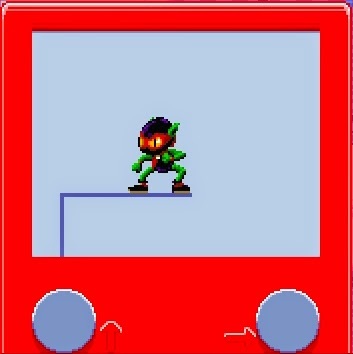 Zool himself is equally weak with only three bars of energy, struggling in a world of instant kill pits and far too many ‘leaps of faith’ onto platforms that start off screen. 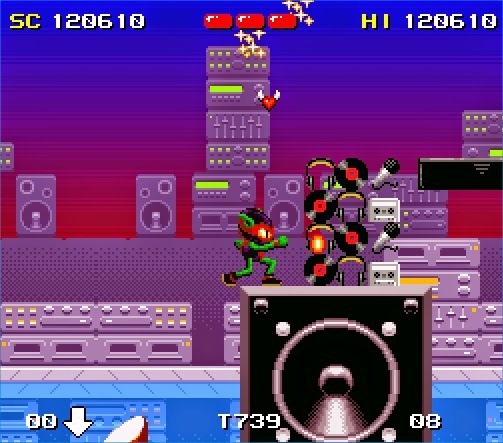 The speed of the game may please bosses but ‘Zool’ runs at such a pace that it’s unplayable when played without literally stopping and pausing for breath. The scrolling speed doesn’t show enough ahead of where you are to avoid environmental hazards and the frantic pace is at odds with the precise jumping demanded in the later levels. To make things worse, the screen is so cluttered with decoration it’s hard to tell what’s potentially going to kill you and what is simply a part of the background. 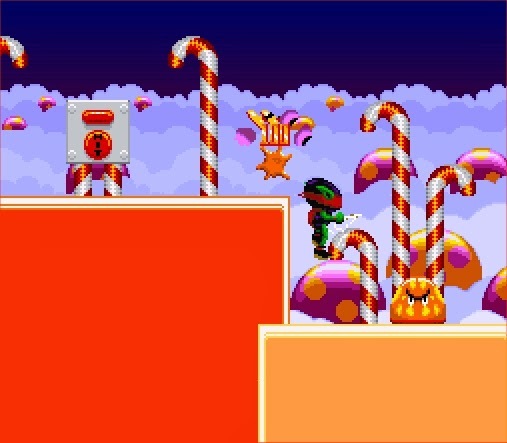 Based on the Amiga 1,200 version of the game, Snes ‘Zool’ is a colourful bright but busy affair. Each world looks distinct, and the multiple layers of parallax scrolling make it a visually very impressive game but there are times when there just too much going on onscreen. 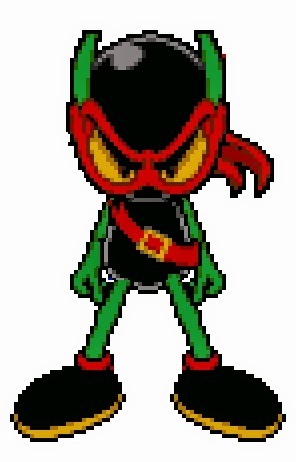 Zool as a charter may ooze embarrassing Ninties’ attitude, but at least he does it looking good though. 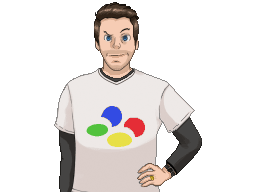 As detailed as ‘Cool Spot’, he is well animated with “over 80 frames of animation” according to a developer interview with Amiga Action. The pleasant visuals are surpassed by the music, a fusion of the distinctive synthesiser sound of the Amiga with the familiar notes of a Super Nintendo. Considering this game is made by the same team that did the ‘Lotus [‘Top Gear’] ‘ games, it isn’t surprising I find the music wonderful (you may recall that the melodies of those driving games were good enough for me to want the games irrespective of game play). While there are only five or six different tunes, they are each catchy and after 20 years still memorable. The only problems are they loop too quickly and are repeated across the different worlds. Toe tapping though is ill advised, since it only serves to ensure death happens quicker. It is slightly sad that the best track is heard on the third world which some players simply won’t reach without devoting time to leaning the complex levels or imprecise controls. In Britain things that divide opinion are often called ‘Marmite’, it’s a phrase I’ve never really understood. I’m happy enough to have the salty black savoury spread on toast in the morning, but should it suddenly vanish off the face of the planet I wouldn’t notice - I would have peanut butter or jam. 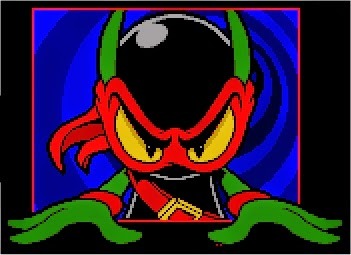 Marmite however is the perfect food for me to liken to ‘Zool’ to. Some may hate it, some may adore it but for me I’m completely indifferent to it. It’s fun to play, but while you do there’s always the niggling feeling you could be playing one of the better games that it has shamelessly stolen from. ‘Zool’ really is less than the sum of its parts, the ingredients were great, but they only worked in separate recipes. It’s a game that copied what was popular at the time without really thinking about how the stolen elements would individually contribute to an overall fun cohesive experience. Gremlin may have wanted to make a ‘Sonic’ or ‘Mario’ beater, but for anyone who has the option of playing either of these opting for ‘Zool’ is a terrible idea. It’s an exercise in excess; too fast, too busy, too hard and really just too much. As mentioned above I got this on a whim from eBay propelled by childhood memories of the game. It was in near mint condition and only cost £11. Some were jealous I had it, some pitied me but I’m pleased I have gone back to it. It’s not a” Sonic beater”, it’s not “the best platform game ever made”, but it’s still enjoyable and worth a dabble.